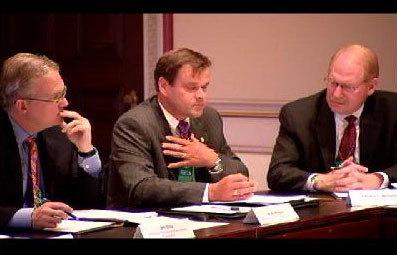 APhA Foundation CEO Bill Ellis, Keith Hodges of Gloucester Pharmacy, and me at the White House HCR Stakeholder discussion. Screenshot from White House live video feed. On Thursday, I went to the White House with Michelle Herbert Thomas (Richmond Apothecaries and former APhA Foundation Board Member), Bill Ellis (APhA Foundation CEO) to meet with Nancy-Ann DeParle, the Health Care Czar for President Obama. We were invited along with about ten other primary health care organizations to discuss the importance of folks like us to Health Care Reform. I was impressed with the collaborative vibe in the room, which included family practice, pediatricians, nurse midwives, optometrists, dental assistants, physician assistants, psychologists, and three pharmacists from NCPA. We had the opportunity to make the points that pharmacists, often as the entry point to the health care system for many consumers, must play a major role in any reformed health care system. We cited evidence of our effectiveness, and our ability to scale to meet the national challenge of a medication use crisis. The growth of pharmacist-provided immunizations to 80,000 pharmacists and an expected 5 million shots this fall was used as an example of how we can scale. Michelle was great in describing her MTM practice while expressing frustration with the high threshold that limits access for Medicare beneficiaries to those services. She also pointed out that insurance plans often favor big health system pharmacies and exclude primary care givers. Other professional groups in the room resonated with her plea to expand access for typically small primary care provider groups. Bill Ellis described great examples of how pharmacists are working collaboratively and also reminded the group of the many government providers of MTM, including DoD, VA, IHS and PHS. Tomorrow (July 4th) we expect to welcome about 350 friends and family to join us in celebration of our nation’s birthday. I hope you have a safe and fun filled weekend. Remember – He who goes forth on the Fourth with a fifth may not go forth on the fifth at all.